Chase covers are used at the top of chimneys to keep out rain, snow, critters and everything else from the inside. They help prevent the major damage to your home from different weather changes giving superior strength that can withstand storms, ice, and heavy snow. Chase covers help in preventing the elements from entering your home and causing mold growth. If the chase cover is older than its expected lifespan than there are more possibilities for it to rot and leak. Our professional guidance can help you explore if a change is required or not. The maximum life that an old-fashioned, galvanized chimney chase cover can serve is seven to nine years. Negligence may cost our customers more than they would expect and so should be inspected to prevent issues from developing. A quality product, such as EverGuard Chimney Chase Covers can save you from high costs, voiding warranties, and give your chimney a sleek look and added strength. Welded collar and seams give superior strength to the installation. Creative Masonry & Chimney offers unmatched quality in our stainless steel or copper chase covers. This range helps keep your home safe from water damage. 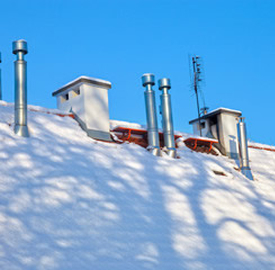 Contact us today to learn more about custom fabrication and installation of your new warrantied chimney chase covers. The average cost to have a new stainless steel chimney chase cover can range from $1200 – $3000 depending on the type of house, the number of holes needed and how accessible the top of the chase is. All chase covers are not built the same! Our premium chase covers are made from a high-quality stainless steel or copper. We have diagonal creases on the top for added strength to help prevent the cover concaving when snow accumulates. We also have a large skirt with a built in water drip edge to help the water drip away from the chimney. Remember your new chase will only be as good as the chimney repair expert measuring and installing it.